Bun B’s Rap Coloring and Activity Book is Now Available for Pre-Order! Congratulations to Bun B and Shea Serrano. Their blog turned book is set to release on September 17, 2013, but you can reserve your copiesssssssss now! 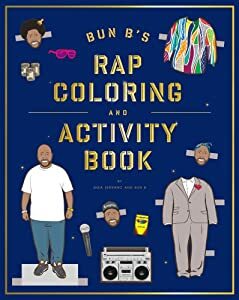 Rapper Bun B lends his street cred and occasionally his face to the creative, hilarious, and just flat-out fun imaginings of Shea Serrano in Bun B’s Rap Coloring and Activity Book. Described by the Washington Post as “what every hip-hop head wishes they had as a child,” this imaginative work started as a series of printable rap-related coloring and activity images. The 48-page, fully interactive book of coloring pages, unbelievably clever activities, and smart plays on rap culture brings these stars and their music right into your living room.